A new study by PsychTests.com indicates that while individuals with high and low self-esteem may both desire power, their motivations vary considerably. A person’s attitude toward power depends significantly on their self-esteem. While a desire for power can be found in people with high self-esteem as well as low, this desire stems from difference sources and different motivations. What compels a politician to throw his or her hat in the ring and run for president? And once in a position of power, what is the strongest factor that can bring about their demise? The answer, according to research from PsychTests, is self-esteem. For those with high self-esteem, power is an ambition, a motivation, a validation of their worth. For those with low self-esteem, it’s an ego-bruising pursuit that results in blow after blow to their confidence. 51% of the high self-esteem group and 33% of the low self-esteem group believe that having power will improve their life. For people with high self-esteem, gaining power is just one of their many ambitions. They want to be in a position of authority because they believe they deserve the accolade and success. For those with low self-esteem, power comes with responsibility and accountability, neither of which they believe they can handle. People who suffer from “Imposter Syndrome” (the belief that they do not deserve any of the success they have attained) are more likely to have low self-esteem. 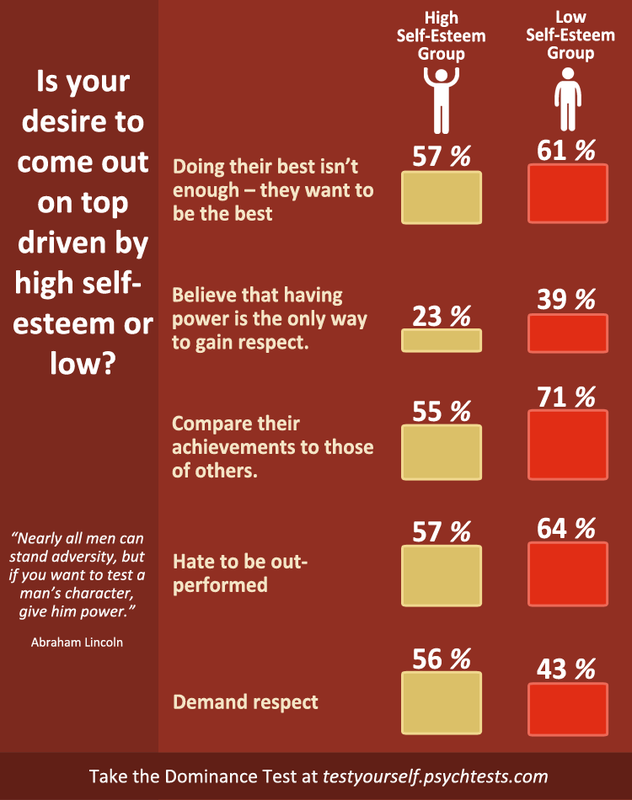 43% of both the high self-esteem group and the low self-esteem group see power as a way to improve their social status. An increase in social status confirms the high self-esteem group’s belief that they are worthy of popularity and recognition. For those with low self-esteem, an increase in social status boosts their confidence by silencing their inner critic and doubter, at least temporarily, and making them feel like they belong. 23% of the high self-esteem group and 39% of the low self-esteem group believe that having power is the only way to gain respect from others. People with high self-esteem recognize that they do not need to be in a position of power in order to be respected. For those with low self-esteem, it’s a catch-22: While they feel that power is important for respect, they are also concerned that being in a position of authority can bring to light their weaknesses, proving to others that they can’t handle the responsibility. Along the same vein as the previous statistic, 56% of the high self-esteem group and 43% of the low self-esteem group demand respect – but for different reasons. The high self-esteem group believes that they should be respected by default because they deserve it. While those with low self-esteem understand that respect should be earned, they are still not sure whether they are worthy of it. 63% of the high self-esteem group and 32% of the low self-esteem group feel more confident in a position of authority. 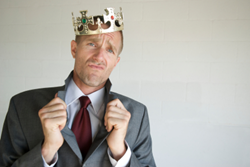 While people with high self-esteem see power as an ego boost and proof that they are deserving of their position, those with low self-esteem view a position of authority as a challenge that they may not be able to overcome. 57% of the high self-esteem group and 61% of the low self-esteem group feel that doing their best isn’t enough – they want to be the best. Both groups also hate being outperformed (57% and 64% respectively). People with high self-esteem won’t settle for the status quo or an “average” performance. Battling for top spot ignites their competitive spirit. Individuals with low self-esteem are plagued by extreme perfectionism, and may often set unreasonable goals for themselves in an effort to prove their worth. Unfortunately, the inevitable disappointment of not living up to these extreme standards only serves as another blow to their already fragile ego. 55% of the high self-esteem group and 71% of the low self-esteem group compare their accomplishments to those of other people. For the high self-esteem group, measuring up their achievements to those of others acts as a source of motivation and pushes them to accomplish more. For those with low self-esteem, the juxtaposition is a double-edged sword: If they come out on top in the comparison, they feel good about themselves. If they are not as successful as those they compare themselves to, it’s yet another blow to their ego. 71% of both the high self-esteem group and the low self-esteem group hate to lose. Losing brings out the high self-esteem group’s competitive spirit; losing only makes them want to try harder and keep battling until they come out on top. For the low self-esteem group, they see losing as confirmation of their incompetence. How you feel about power is a reflection of how you feel about yourself.The pursuit of power can be a double-edged sword, particularly for people with low self-esteem.